BroadWave is your answer to streaming live audio over the web using computer. It can also stream audio recordings loaded in most audio formats. 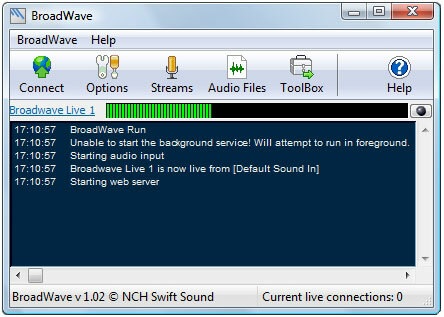 Listeners do not need to install any special software to listen to a BroadWave webcast. BroadWave streams will play directly from the default web browser on any modern Windows, Mac or Linux computer. Up to 8 different live streams can be served from the single PC by installing additional sound devices. * Create an internet radio server to broadcast your own live or prerecorded shows and music online. * Broadcast live events such as music concerts to build a world wide audience. * Reach a remote audience with a live audio stream of religious worship services. * Plays automatically in almost all popular browsers including Internet Explorer, Firefox, Safari and more. * Up to 8 different live streams can be served from the single PC by installing additional sound devices (eg. USB sound). * Live streams can be recorded and saved as a wav file. * Unlimited number of 'static' recordings can be served. * Pre-recorded audio can be streamed as a playlist. * Automatic conversion of audio files when loading into the application to the optimal file format for streaming. * Displays number of users connected to your streams and IPs can be logged. * A DB display for each live stream configured. Qweas is providing links to BroadWave 1.02 as a courtesy, and makes no representations regarding BroadWave or any other applications or any information related thereto. Any questions, complaints or claims regarding this application BroadWave 1.02 must be directed to the appropriate software vendor. You may click the publisher link of BroadWave on the top of this page to get more details about the vendor.